I've decided to set up an author's page, even though it should be said that I'm very new at writing fanfiction and I only have three fics in store for now. I started writing in mid-2012, and I'm still going at it. For someone who didn't even know about the existence of fanfiction, I'm having a great time writing these stories! I'm here to share them with all of you, in hope you enjoy reading them as much as I enjoy writing them. I'm a huge Max&Liz fan and, even though I like Michael&Maria as well, I just don't feel comfortable writing for them, so my fics are Dreamer. All the banners were exquisitely crafted by behrbabe, to whom I am eternally grateful! Summary: Set in “The Departure”. The conversation Max and Liz were supposed to have. Author's Notes: This story deals with a theme stuck on every Dreamer's throat. This was my first fan fic ever. The first and only to survive the tyranny of the trash bin... or of my perfectionism. Or both. I hope some of the cathartic relief I felt when I wrote this fic rubs off on you. Tell me what you think of it. I'll be glad to read any comments and answer any questions you have! Summary: Set in “Four Aliens and a Baby”. Liz and Tess are on their way to the Base. Author's Notes: Maria's speech to Liz at the Crashdown in "Four Aliens and a Baby" inspired me to write this story. I agree with Maria that Liz needs to make a decision about her life once and for all. Liz has been procrastinating with all of her "anger and hatred" for months now. Is that why she knowingly got in a car with a consummated killer? Or was it there some other sinister purpose that forced Liz into that car? Summary: Set in “Graduation”, after Liz accepted Max's proposal. So, what happened before the camera faded out? Author's Notes: I've always wondered about the moments after that wonderful marriage proposal. Every Dreamer has, I think. So I decided to write a story about this particular moment. It contains references both to Melinda Metz's books and to certain episodes. It's my hymn to Max and Liz and the pure Love they share with one another. Summary: Have you ever wondered what happened to Max and Liz after they left in “Graduation”? 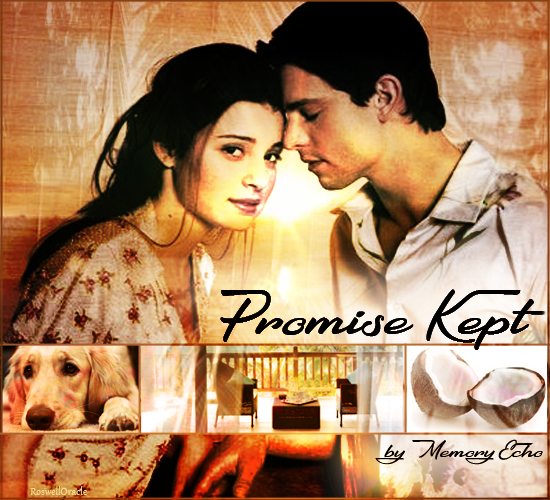 This banner was made by RoswellOracle. Thanks again! Summary: Max and Liz have a definite talk about their relationship. Author's Notes: This one came out of "Hell's Gate". The 'sleeping cure' is explained. Last edited by memory_echo on Tue Dec 12, 2017 4:52 pm, edited 8 times in total. I'm sure behrbabe will also be happy to know that you like the banners! The only thing I can tell you is that the next two will be much bigger. "Hell's Gate" will the next in line. It's 9,638 words strong and getting closer to the end. "Everloving" is 10,392 words and counting. Still a lot of work ahead for this one. Last edited by memory_echo on Wed Feb 19, 2014 11:59 am, edited 1 time in total. I don't know if I'm going to write any more stories... I have some ideas for a season 4 type fic, but nothing without a proper plot. Just scattered ideas. If they ever come up to anything concrete, you'll hear from me again. "Hell's Gate" is done at last! The irony is: I said to myself that I could finish it in a week of 'sprint writing'. I was wrong. Dead wrong, in fact! It took me well over a month to finish this fic. The first unedited draft is 19,095 words long, which makes this the longest story I ever wrote. This moment in the Roswell narrative was very appealing to me. Two things you didn't see every day was Liz and Tess in the same vicinity for long, and Tess being honest. Add to that the fact that Tess had no voice of her own throughout the show, and you will understand why the concept proved itself too appealing to resist. I always felt that it was a great lost that the conversation was so short (it felt that it had been truncated, somehow), and that Tess could never tell her own story. The subject wasn't easy to deal with (considering that I am a Dreamer) but it felt really good to finally lay many 'ghosts' to rest. Now I'm going to let the fic sit for a while and I'll work on "Everloving" for a few days. I need to clear my head before I start editing "Hell's Gate". It's good for me, and better for the story if I have some emotional distance from it. After I edit the fic, I'll start looking for a beta reader to help me with the grammar. And then, it'll be posting time. can't wait until you share these with us! keepsmiling7 wrote: can't wait until you share these with us! Hi I can't wait to read your fics. I love your banners. If anyone could help me, I would be eternally grateful. As some of you know, my health hasn't been cooperating with me lately. The haemorrhage in my left eye is still bothering me, so I haven't been able to write. I'm scheduled for surgery on the 25th, and I'm praying that there's nothing wrong with my retina, otherwise blindness becomes a very real possible outcome. Because I haven't been able to spend long periods at the computer, I can't even write my tics anymore (probably, the only activity that could keep me from going insane from all this). I want to thank everyone who has been supporting me through the writing process and for your feedback. 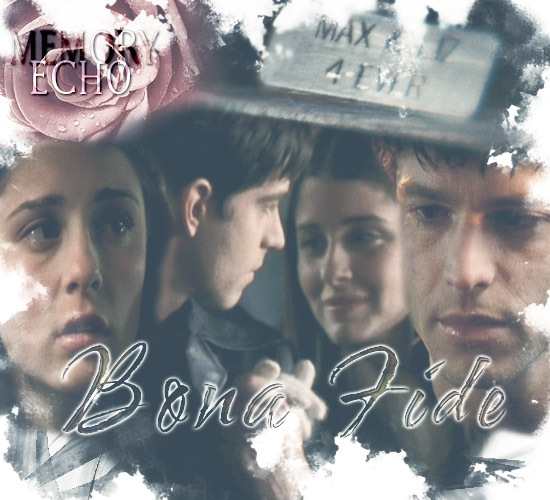 I had a wonderful time sharing "Bona Fide" with you all!